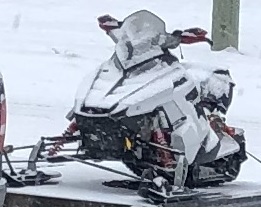 Between the hours of 11:30 PM on Saturday, Dec 22 and 8:00 AM on Sunday a white with black panel 2010 Polaris Rush 600 snowmobile was stolen from a residence on Pritchard Farm Road in East St. Paul. The snowmobile was last seen strapped down to a trailer in the owner’s driveway. Anyone with information about this incident is asked to call the East St. Paul RCMP Detachment at (204) 667-6519.